Villa Surrender on the Magical Island of Curacao! 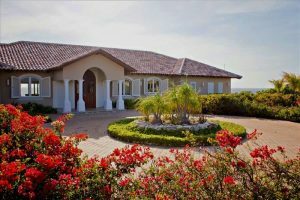 Book your perfect Curacao vacation rentals with us – Stunning oceanfront villa “Surrender”! Villa Surrender is situated in a gated community on at the secluded western edge of Wespunt and was built for easy living. It is the perfect place to relax or plan tropical island adventures with family and friends. “Surrender” to the blue sea, warm sunny days and starry nights. Once you arrive at the end of our cul-de-sac, you’ll travel down a long private driveway. 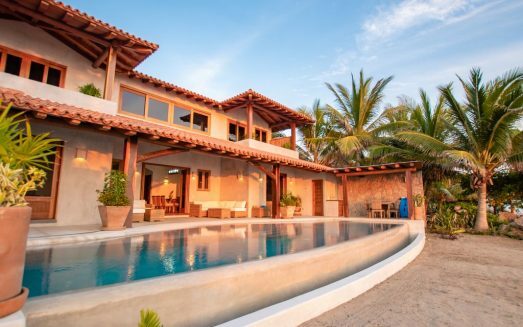 Imagine beautiful, flowering, tropical plants, a small grove of shade trees with a sitting area, a natural stone stairway carved into the bluff leading down to the ocean, a cliff diving platform and rock walls along the property lines. And let’s not forget the terrace! With more than an acre of private oceanfront property, there’s more than enough room to explore, to breathe in the ocean air, and leave the everyday behind you…..Welcome to Surrender! And we’ve got a white flag flying high above the ocean to re-mind you to do so. Step inside and be inspired. From the ocean views in almost every room to the 30 foot wall of sliding glass doors that open the entire living area to the ocean, this home brings the Caribbean with its balmy, island, breezes, right inside the house. Guests have described the villa interior as “tasteful, light-filled, spacious, airy, and relaxed”. We agree and we like to think of it as home. Our kitchen was designed with the chef in mind. Fully outfitted and equipped with high-end appliances guaranteed to elate your inner gourmet. Not a devotee of meal preparation? No worries! Our tried-and-true restaurant recommendation list includes enough eateries for you to try something new every night you spend on Curacao. Our personal concierge, Hynrich, will happily make reservations to suit your wishes and, if you find yourself absolutely unable to leave our little oasis, he’d be delighted to arrange for a personal chef to come prepare a meal for you. Sleeping accommodations include a large master suite with a king-size bed, a separate meditation or sitting room (with an additional sofa bed), an enormous private bathroom with double vanities, a jetted tub and bidet. Step through the master’s private doors onto the poolside terrace for an evening swim and sweeping views of the Caribbean. Two other generously-sized bedrooms (also oceanfront) can accommodate up to four persons and are separated by a Jack-and-Jill bath. The enormous family room has doors that open right onto the terrace. With its large screen Hi-Def TV, two queen-size pullout sofa beds, bureaus, closets and a private bath, it provides great sleeping accommodations for up to four people. A fourth smaller room is nestled at the other end of the house and is perfect for a nanny or an extra guest with yet another full bath nearby. All rooms feature high quality linens for bed and bath and an abundance of closet and bureau space. Each room has its own temperature controls and reading lamps. But the piece de resistance, the most special feature of Surrender and the spot where we spend most of our time is the terrace.